Good and reject parts go down separate tubes. 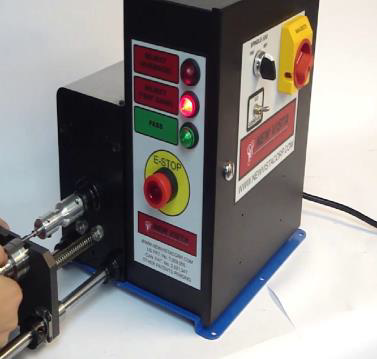 A new-style single-spindle SCC-MN, verifying M7 holes in automotive End Pieces. Multiple-spindle versions are also used for End Piece work. SCPMs like the one pictured here are all-mechanical SC-type thread machines. They cost less than SCCs do, but they are suitable only for simple hand-loaded work; they don’t have a control that will accommodate power grippers or automation. The SCPMs are electric motor-driven, they self-reverse at depth, and you get a green light when depth is achieved. Torque is set with a hand knob. 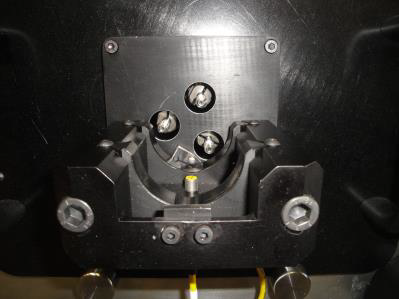 Quick-change tooling for 3-hole work in a four Spindle Unit SCC-MX. Fast. 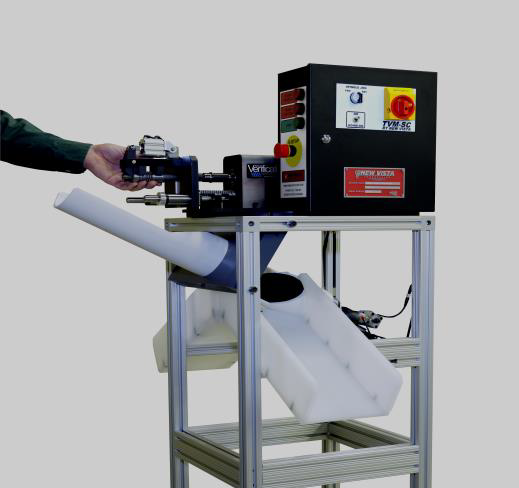 Manually-loaded floor-to-floor cycles of 3 to 4 seconds are regularly attained. Automated machines can be twice as fast. Models available that will run a large variety of internal or external, straight or tapered threads. Utilizes production-proven, patented New Vista mechanisms and controls. Low maintenance and long thread gage life. 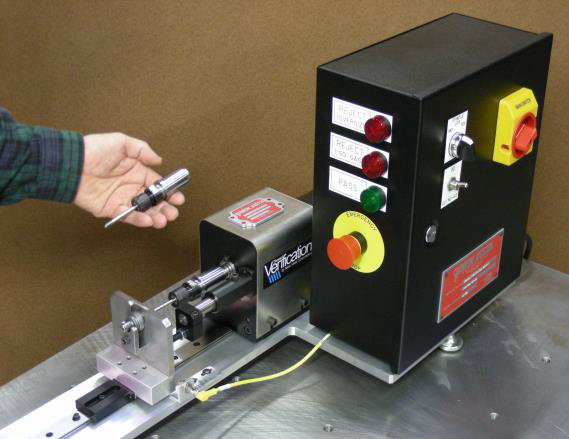 Lockable, micro-adjustable setting knobs provide for precise thread depths. 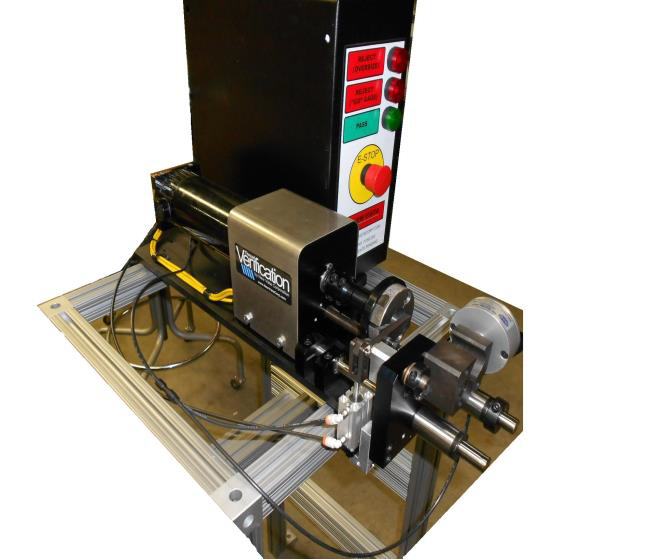 Sensitive high-speed drive allows spindle to stop quickly if an obstruction is encountered. Will not subject the part or the tooling to high force or torque levels. Will not jam or stick in undersize or short threads. Will signal short threads, no threads, undersize or oversize threads, obstructed threads. Outputs are available for integrated applications. Supplied tooled and proven out for your application. 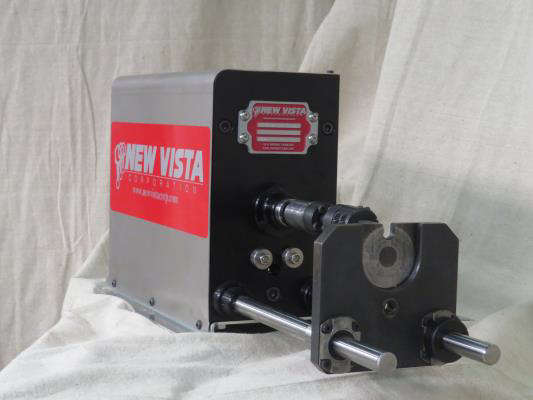 The economical way to run fast cycles in either high and low volumes. 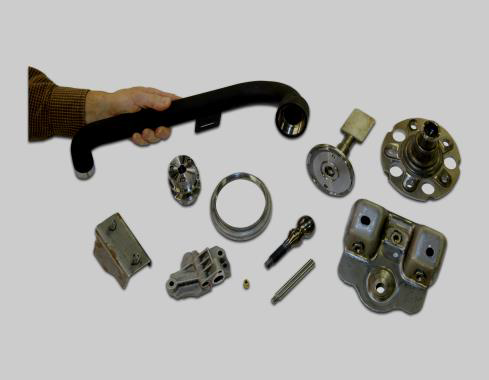 Will run a variety of parts; tooling is inexpensive. Available with Quick-change Toolholders and Fast-change Fixtures. Auto load, auto unload and auto sort options are available. Most changeovers in less than 30 seconds. A “–CMB” suffix is applied to the model number if the machine will be used for “Combination” thread gaging, or for pipe thread gaging. Tooled for Projectile: M15 internal thread; 3.3 second cycle. 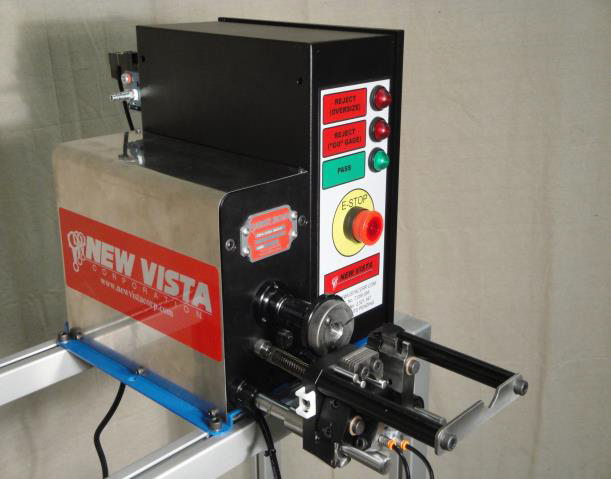 Equipped with Quick-Change Toolholders and Fast-Change Fixtures. Changeover time: less than 30 seconds. Quick-changeover grip-type fixturing for male threads, on an old-style TVM-SC-2. This one runs several thread sizes, up to M25. See http://youtu.be/kf-lqnRWLUs 2. 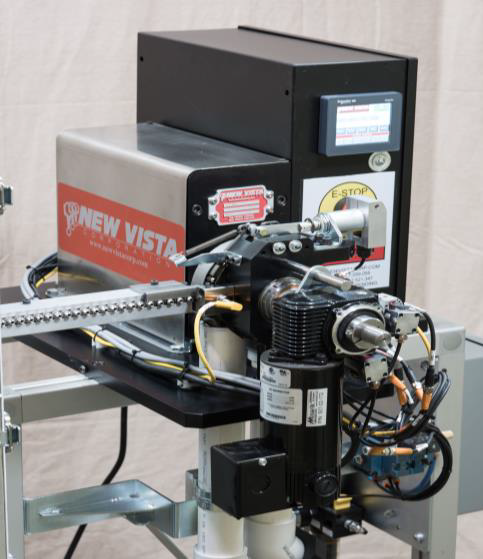 This old style New Vista TVM-SC-1 can be viewed at: https://vimeo.com/1056651181 The operator there is verifying four threaded holes – two different thread sizes and three different thread depths – all in 20 seconds.